You can own the most energy-efficient air conditioner in the world, but if you don’t follow proper air conditioner cleaning and maintenance standards, it won’t operate optimally. An inefficient air conditioner can use more energy than it should, and that means that it will cost you more money. Energy.gov notes that human error often tops the list of explanations when an air conditioner is not working well. Sometimes, it’s an easy fix. Central air conditioner cooling is dependent upon the windows and outside doors being closed. A room air conditioner, though, should be isolated in the room or group of rooms it’s meant to cool. Leaking or low refrigerant levels are a common culprit if your air conditioner just doesn’t seem to be doing its job. An air conditioner’s performance and efficiency are directly related to whether or not the refrigerant charge exactly matches the manufacturer’s specification. Leaks can also be harmful to the environment. Energy.gov recommends calling a professional to fix central air conditioner problems if you suspect that a refrigerant leak could be the issue. If you have a room or window unit air conditioner, it could also be experiencing sensor problems. The first step for how to fix an air conditioner like this would be to see if the thermostat sensor is out of place. A room air conditioner’s sensor is behind the control panel. A sensor that’s out of position could prompt an air conditioner to cycle erratically or cycle too much. This can sometimes be fixed by slowly bending the wire that holds it in place, being careful to make sure the sensor does not touch the coil. 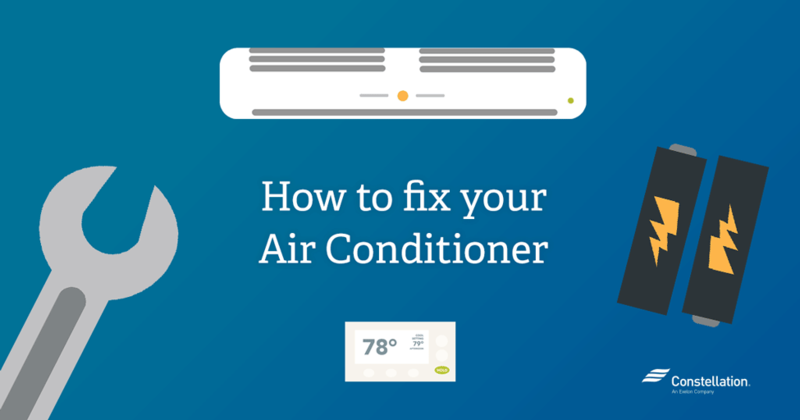 If you’re still at a loss for how to fix an air conditioner that’s just not working right, it might not be adjusted to the correct setting, or it could have a clogged drain. If your air conditioner doesn’t turn on, try replacing the thermostat batteries or checking fuses. Let the unit cool for at least five minutes before trying to reset any breakers. If that turns out not to be the fix, central air conditioner compressors and fans could also be the culprit. They could be worn out from the system turning on and off too frequently. That kind of cycling can also occur if your air conditioner is the wrong size. Contacting a pro likely makes sense at this point. Ductwork can often be behind airflow issues. The ducts could be leaking air or be clogged/constricted. The same is true for dirty filters. Ready for spring cleaning? Air conditioner maintenance could be easier than you think. Several malfunctions can be avoided with proper maintenance and air conditioner cleaning. Here’s how to clean an air conditioner to ensure that it operates at top efficiency. Air conditioner cleaning should start with the air filters, both prior to use and once a month during high usage. Clogged filters can impact airflow. Energy.gov notes that cleaning air conditioner filters can lower an air conditioner’s energy consumption by 5 percent to 15 percent. Ask Heloise offers this advice for how to clean an air conditioner filter: Remove the filter and then vacuum it with the long, narrow attachment to remove as much dust as possible. Then rinse the filter with hot or cold water. Do not, she advises, use detergent. That can trap the dirt. If the filter is really dirty, Heloise recommends adding a tablespoon of baking soda to one quart of water and moving the filter around in this solution before rinsing and letting it dry. If dust particles are still trapped, try vacuuming again, or it might be time to simply replace the filter. For window units, inspect seals to make sure cool air isn’t escaping. If you have a split system, clean debris and leaves from the fan, compressor, and condenser. Prevent clogs in your unit’s drain channels by passing a stiff wire through it. You can prevent this kind of build-up by trimming foliage back by at least two feet around your condenser. Refrigerant concerns: Only professionals can check for the correct amount and test for leaks using a leak detector. Refrigerant must be gathered correctly so that it is not illegally released into the atmosphere. Measuring airflow through the evaporator coil. Verifying the electrical components in the air conditioner. They can confirm, for instance, that the electric control sequence is correct and make sure that the heating and cooling systems can’t operate at the same time. Professional technicians can also check electric terminals, clean and tighten connections, and apply a non-conductive coating when required. Confirming accuracy of the thermostat. Home maintenance is time-consuming and can be tricky. But, knowing how to clean an air conditioner can definitely save you some time and money. Here’s to a relaxing, cool summer! Hi, Jim: Thank you for the feedback! I am so glad to hear that it was helpful to you — we’re always trying to help our customers save money, whether it’s by supplying cost-effective energy or encouraging you to be energy-efficient in your home. If you’re interested in more home-improvement tips, check back soon because I’m working on a post about how to check for attic leaks. Where the hell is the evaporator coil for crissake?? Hi, Jim: Sorry if I caused any confusion. The evaporator coil (also called the “indoor” coil) is the mechanism by which heat is transferred within your heating or cooling systems. Inside this coil, refrigerant evaporates as it absorbs heat from the indoor air. That means it’s actually exchanging heat with your heat system in the winter and your air conditioner in the summer. How your coil is accessed for cleaning depends on your specific air conditioner model. You might be able to find more information about where to locate your evaporator coil in your unit’s instruction manual. Thank you for asking! I hope that helps. Great tips for keeping your air conditioner in good working order! It helps knowing when you can do something yourself, or if you need to call a pro. Hi, Jason! Thanks for reading, and for your comment. I’m so glad that you found the tips for how to fix your air conditioner to be helpful. Yes, it’s great when you can do some home repairs yourself. Stay tuned to the blog… coming soon, we’ll have a post on how to check your home for energy leaks (like doing an at-home energy audit). See you soon!